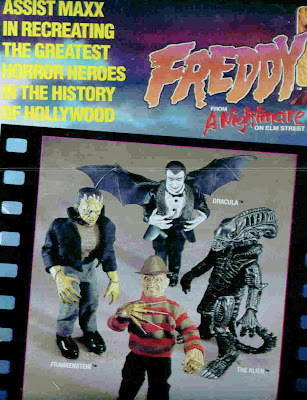 During the height of the Freddy Krueger craze of the late 1980s, Matchbox released a unique toy that added Robert Englund's popular Dream Demon to the pantheon of classic movie monsters (including Dracula, Frankenstein's Monster and the titular character of Alien ). The toy was Matchbox's "MAXX FX Now Showing: Freddy Krueger." "Recreate all your favorite movie monsters with these authentically detailed body parts," the box went on to describe. "Clothing and accessories help you quickly transform the mild-mannered MAXX into spine-chilling monsters. You can even mix'n'match characters on Maxx's fully articulated body to create your own unstoppable menace." The other benefits of the toy? "Completely poseable," "authentically detailed," "easy on/off assembly." The box also promises that the toy "lets you in on the secret world of Special Effects" and implores the customer to "collect the whole world of MAXX FX." So basically, you've got your average Ken doll here, garbed in a yellow short-sleeved short and plaid pants, and then a variety of clothing accessories that transform this smiling, mild-mannered gentlemen into the scourge of Elm Street. Among the accouterments: a gruesome Freddy head, a stylish (but ratty...) fedora, the famous Freddy glove with finger knives, and that gnarly green and red striped sweater. So dress up Ken (err, Maxx...), and "you...make...the..the change...happen!" Yes, Maxx is indeed the "Quick change artist and the master of special effects." This is a fun toy, and for those Freddy fans out there who wanted to see kindly Ken transformed into a brutal serial killer and then go after Barbie...MAXX FX's Freddy is the toy for you. 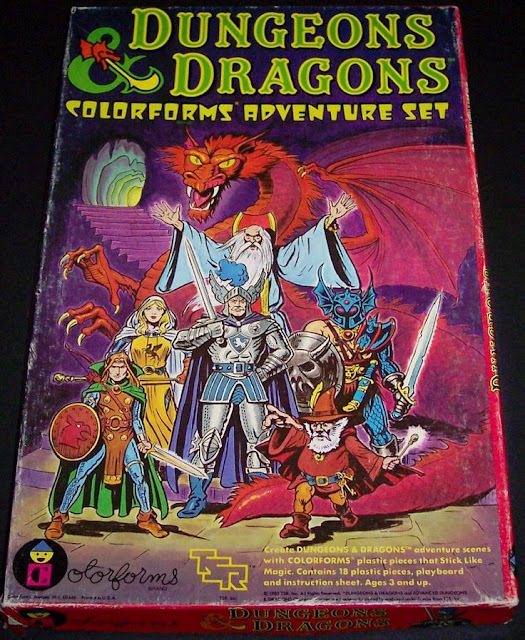 Intended for kids ages 6 and up (I barely qualify...), I still have this toy in the box (my grandparents found it for me at a flea market in the early nineties...). However, I have never - in any of my collecting travels - seen any of the other three figures in the set (Frankenstein Monster, Dracula - with bat wings - or, most interestingly, the alien). Somehow, I don't think that they were actually released; that perhaps Evil old Freddy here was the Maxx test balloon...that popped. I'd love to get my hands on the Alien one of these days (if only to spit molecular acid on Barbie...) but none are to be found even on E-Bay. Indeed, the other figures sadly never got to see the light of day. After several parents threw a mega hissy fit about the Freddy, the line was scrapped altogether.